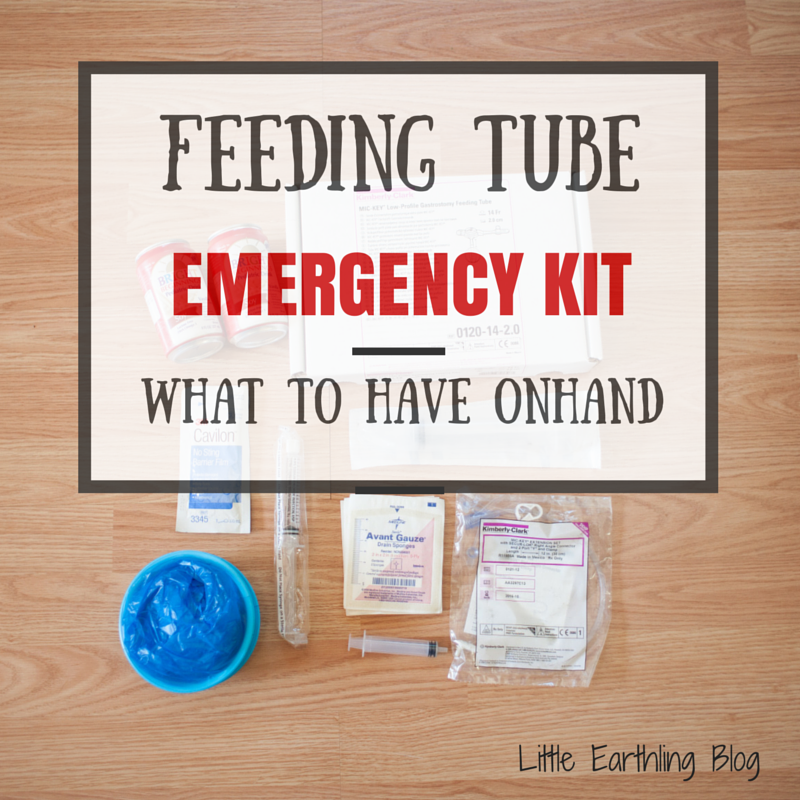 If you have a child with a feeding tube, you probably understand the stress of worrying that you will be away from home at feeding time only to discover you are missing an essential supply. This has happened to me twice. Once we were one a road trip and had to head home for extra supplies (we had a feeding bag malfunction) and once when I had Apollo at a sleep study and forgot to bring an extension. 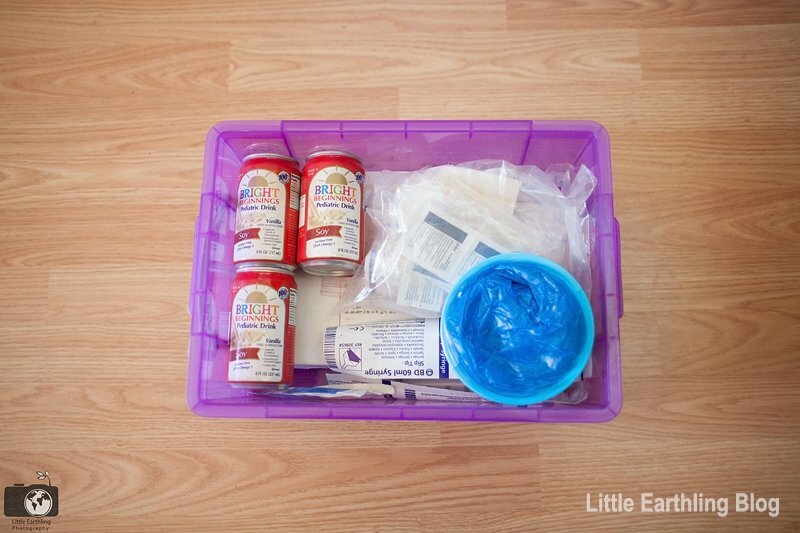 We keep this box of feeding tube supplies in our van at all times, in case of emergencies. Amazingly, most of these items can be found on Amazon! I have affiliate links in my list below. Chuck and I have found it worthwhile to invest in a few extras, so we never run short. We have been saved on more than one occasion by the supplies in this box. Click here for the free printable list! All of these are packed in a plastic box with locking that slides under a seat in our van. The other supply I consider essential is this VersaVia seat cover. For the first couple of years that Apollo had his feeding tube, he would vomit completely randomly. There was never any warning…He would be sitting there one minute and vomiting the next. More than one time we’ve had to pass back a vomit receptacle while we were driving. I love the VersaVia car seat cover. It slips easily over any standard size seat and protects from liquid, sand, dirt, etc. It is easy to clean with a cloth or vacuum and can easily be thrown in the washing machine. This seat cover is an idea for anyone with children under the age of 18! I hope this list is helpful to you. I know I prefer to have a checklist over reinventing the wheel and worrying I’ve forgotten something. This is a great list and idea. I may share it with some of my patient’s parents. Thanks! Please do! I would have loved to have this when I started out! What a good idea. The scouts were on to something with that always be prepared business. Owen yanked his NG tube out once when we were in town and I realized that I didn’t have a stethoscope with me to check placement.Since he was only about 2 months old at the time, a 40 minute wait until we could get home plus the time to insert the tube was a pretty big deal. After that, my emergency kit was born. Everywhere we went, I took the regular diaper bag, the feeding bag, and the pumping bag since he was getting expressed breastmilk at the time. While we don’t have feeding issues thos does make me think of all the times we’ve been left in the lurch without some essential necessity. A kit with those for back up would be a good idea. Well, praise God no one in my family has a feeding tube, but with 6 ages 6 and under we *do* throw up in the car on occasion, plus carseats put a lot of wear on the van benches. I’d love to win that seat cover! Hey Renee, I am a part of a Facebook group called Medical Supply Exchange where people with surplus supplies can send (free or for copay reimbursement) their spare supplies to people who need them. There are a lot of tubie families on there and most things are free (just pay cost of shipping) and you would be able to stock up on things like back up mic-keys, syringes, bags etc. I use it to get rid of my excess IV supplies (my home health pharmacy sends soooo much) but they have all sorts of medical supplies, formula, and special needs equipment. I think they aren’t accepting new members right now unless you know someone in the group so feel free to email me if you want to get in. Just thought it might be helpful for you. 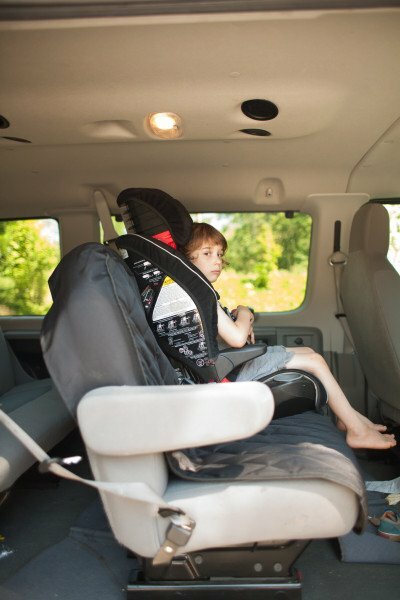 I am shocked with how much damage kids do to car seats! This is a great idea! This is a great seat cover! My co-worker has one, and she loves it! No feeding tubes here either but our list of basics is extra underwear & shorts/pants. Plus extra socks for a kid likes to jump in puddles & sock his shoes to the bone. Until recently another essential was our folding potty seat but our little guy got pinched by it & refuses to use it anymore. Now we have to come up with another “on the go” solution for quick potty breaks in a store. When we’re out for the day we carry the potty chair – put a plastic grocery bag in it then line with a diaper. why hasn’t anyone thought of this before. And by this I mean your list and the seat cover! You brought me back to my feeding tube days. Not necessarily happy memories but humbling . What a great idea. I love the seat cover, so very practical. I would love to have one. That car seat cover looks awesome! I am so paranoid about being without feeding supplies I keep a spare kit in both the car and the diaper bag. I love my free spirit child, but boy can he make a mess in the back seat!! With 8 children in a Sprinter, 5 of which are in car seats/booster this seat cover would be fabulous! This is a great checklist! I never thought about a seat cover, that VersaVia seat cover looks awesome.